Own Iron Man - Armoured Adventures Complete Volumes 1 to 2 DVD from Deff, DVD, Blu-Ray & 4K Video Specialists - Free UK Delivery..
Marvel makes cinematic history again with the most unexpected team-up in the universe! Joining forces for the first time ever, Hulk’s brute strength and Tony Stark’s high-tech brainpower come together to face off against the ultimate enemy. When “Zzzax,” a seemingly invincible, energy-devouring monster, threatens to destroy the planet, Marvel’s unlikeliest pairing of Avengers is mankind’s only hope. Alone, neither can defeat the awesome.. The Invincible Iron Man May Have Met His Match In The New Serum Known As Extremis! An ill-fated attempt to re-create the legendary Super-Soldier Serum leads to the development of Extremis, a military nanotechnology serum that directly taps into the body's repair centre, turning an ordinary human being into a super-powered one man army. Conflict erupts when the Extremis serum is injected into Mallen, a member of a domestic militant group..
Own Iron Man - Extremis DVD from Deff, DVD, Blu-Ray & 4K Video Specialists - Free UK Delivery.. Billionaire Tony Stark, in his Iron Man armour, prevents an attack from a mysterious new foe, but innocent bystanders are killed, including his best friend War Machine, Lt. Colonel James Rhodes. Detained for questioning by S.H.I.E.L.D., Iron Man escapes, determined to find the mastermind behind the attack. Pursued by Black Widow and Hawkeye, Iron Man enlists the help of the ruthless vigilante The Punisher. But can the Armoured Avenger h..
Robert Downey Jr., returns as billionaire Tony Stark in this thrilling sequel to the worldwide blockbuster. Now that his Super Hero secret has been revealed, Tony's life is more intense than ever. Everyone wants in on the Iron Man technology, whether for power or profit...but for Ivan Vanko ("Whiplash"), it's revenge! Tony must once again suit up and face his most dangerous enemy yet, but not without a few new allies of his own. Co-star..
Robert Downey Jr. returns as billionaire Tony Stark in this thrilling sequel to the worldwide blockbuster. Now that his Super Hero secret has been revealed, Tony's life is more intense than ever. Everyone wants in on the Iron Man technology, whether for power or profit...but for Ivan Vanko ("Whiplash"), it's revenge! Tony must once again suit up and face his most dangerous enemy yet, but not without a few new allies of his own. Co-starr..
Marvel Studios (Marvel's Avengers Assemble) unleashes the best Iron Man adventure yet with this must own, unprecedented global phenomenon starring Robert Downey Jr. When Tony Stark/Iron Man finds his entire world reduced to rubble, he must use all his ingenuity to survive, destroy his enemy and somehow protect those he loves. But a soul-searching question haunts him: Does the man make the suit...or does the suit make the man? Featuring .. Lift off with high-speed, high-flying action that takes you inside the suit of Marvel's invincible Super Hero for the ultimate Iron Man experience! After surviving an unexpected attack in enemy territory, jet-setting industrialist Tony Stark builds a high-tech suit of armour and vows to protect the world as Iron Man. 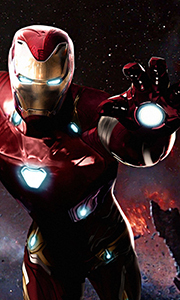 Straight from the pages of the legendary comic book, Iron Man is a hero who is built - not born - to be unlike any other!.. Suit up for action with Robert Downey Jr. in the ultimate adventure movie you’ve been waiting for, Iron Man! When jet-setting genius-industrialist Tony Stark is captured in enemy territory, he builds a high-tech suit of armor to escape. Now, he’s on a mission to save the world as a hero who’s built, not born, to be unlike any other. Co-starring Terrence Howard, Jeff Bridges and Gwyneth Paltrow, it’s a fantastic, high-flying journey ..
Iron Man: Lift off with high-speed, high-flying action that takes you inside the suit of Marvel's invincible Super Hero for the ultimate Iron Man experience! After surviving an unexpected attack in enemy territory, jet-setting industrialist Tony Stark builds a high-tech suit of armour and vows to protect the world as Iron Man. Straight from the pages of the legendary comic book, Iron Man is a hero who is built - not born - to be unlike ..
Iron Man: Suit up for action with Robert Downey Jr. in the ultimate adventure movie you've been waiting for, Iron Man! When jet-setting genius-industrialist Tony Stark is captured in enemy territory, he builds a high-tech suit of armour to escape. Now, he's on a mission to save the world as a hero who's built, not born, to be unlike any other. Co-starring Terrence Howard, Jeff Bridges and Gwyneth Paltrow, it's a fantastic, high-flying j..
Own Marvel - Retro Black Widow Panels Mug from Deff, DVD, Blu-Ray & 4K Video Specialists - Free UK Delivery..
Own Marvel - Retro Characters Mug from Deff, DVD, Blu-Ray & 4K Video Specialists - Free UK Delivery..
Own Marvel - Retro Notebook from Deff, DVD, Blu-Ray & 4K Video Specialists - Free UK Delivery..
Avengers Confidential: When The Punisher takes out a black market weapons dealer with stolen S.H.I.E.L.D. tech, he inadvertently stumbles upon a much larger terror plot under investigation by Black Widow, agent of S.H.I.E.L.D. Detained by the clandestine law enforcement organsiation, Nick Fury offers the Punisher his freedom in exchange for one mission: to work with Black Widow and stop the terrorists group known as Leviathon. Iron Man..
Own Marvel Kawaii - Black Widow Mug from Deff, DVD, Blu-Ray & 4K Video Specialists - Free UK Delivery..
Own Marvel Kawaii - Dare Devil Mug from Deff, DVD, Blu-Ray & 4K Video Specialists - Free UK Delivery..
Own Marvel Kawaii - Drax Mug from Deff, DVD, Blu-Ray & 4K Video Specialists - Free UK Delivery..
Own Marvel Kawaii - Falcon Mug from Deff, DVD, Blu-Ray & 4K Video Specialists - Free UK Delivery..
Own Marvel Kawaii - Gamora Mug from Deff, DVD, Blu-Ray & 4K Video Specialists - Free UK Delivery..
Own Marvel Kawaii - Guardians Mug from Deff, DVD, Blu-Ray & 4K Video Specialists - Free UK Delivery..
Own Marvel Kawaii - Hawkeye Mug from Deff, DVD, Blu-Ray & 4K Video Specialists - Free UK Delivery..
Own Marvel Kawaii - Iron Man Mug from Deff, DVD, Blu-Ray & 4K Video Specialists - Free UK Delivery..
Own Marvel Kawaii - Nick Fury Mug from Deff, DVD, Blu-Ray & 4K Video Specialists - Free UK Delivery..
Own Marvel Kawaii - Rocket Raccoon Mug from Deff, DVD, Blu-Ray & 4K Video Specialists - Free UK Delivery..
Own Marvel Kawaii - Star Lord Mug from Deff, DVD, Blu-Ray & 4K Video Specialists - Free UK Delivery..
Own Marvel Knights Collection (6 Films) DVD from Deff, DVD, Blu-Ray & 4K Video Specialists - Free UK Delivery..
Own Marvel Knights Collection (8 Films) DVD from Deff, DVD, Blu-Ray & 4K Video Specialists - Free UK Delivery..
Iron Man: Suit up for action with Robert Downey Jr. in the ultimate movie adventure, Iron Man! When jet-setting genius-industrialist Tony Stark is captured in enemy territory, he builds a high-tech suit of armour to escape. Now he's on a mission to save the world as a hero who's built, not born, to be unlike any other. Co-starring Terrence Howard, Jeff Bridges and Gwyneth Paltrow, it's a fantastic, high-flying journey that's massively e..
Own Marvel Studios Cinematic Universe Pase 1 (6 Films) DVD from Deff, DVD, Blu-Ray & 4K Video Specialists - Free UK Delivery..
Iron Man 3: The studio that brought you Marvel's Avengers Assemble unleashes the best Iron Man adventure yet with this must-own, global phenomenon starring Robert Downey Jr. When Tony Stark/Iron Man finds his entire world reduced to rubble, he must use all his ingenuity to survive, destroy his enemy and somehow protect those he loves. But a soul-searching question haunts him: Does the man make the suit... or does the suit make the man? ..
Own Marvel Studios Cinematic Universe Phase 2 (6 Films) DVD from Deff, DVD, Blu-Ray & 4K Video Specialists - Free UK Delivery..
Captain America 3: Civil War : An explosive rift rocks the Marvel Cinematic Universe in the game-chaning epic, Captain America: Civil War. When government pressure to reign in the Avengers drives a deep wedge between Captain America (Chris Evans) and Iron Man (Robert Downey Jr.), best friends are turned into bitter enemies. Against a backdrop of divided loyalties, mysterious villains and new allies, the utlimate battle for the future of..
Own Marvel - Logo Mug from Deff, DVD, Blu-Ray & 4K Video Specialists - Free UK Delivery..
Own Marvel Kawaii - Carnage Mug from Deff, DVD, Blu-Ray & 4K Video Specialists - Free UK Delivery..
Own Marvel Kawaii - Characters Mug from Deff, DVD, Blu-Ray & 4K Video Specialists - Free UK Delivery..
Own Marvel Kawaii - Groot Mug from Deff, DVD, Blu-Ray & 4K Video Specialists - Free UK Delivery..
Own Marvel Kawaii - Ultron Mug from Deff, DVD, Blu-Ray & 4K Video Specialists - Free UK Delivery..
Own Marvel Kawaii - Vision Mug from Deff, DVD, Blu-Ray & 4K Video Specialists - Free UK Delivery..
Own Marvel Retro - Covers Mug from Deff, DVD, Blu-Ray & 4K Video Specialists - Free UK Delivery..
Own Marvel Retro - Faces Mug from Deff, DVD, Blu-Ray & 4K Video Specialists - Free UK Delivery..
Own Marvel Retro - Good to be Bad Mug from Deff, DVD, Blu-Ray & 4K Video Specialists - Free UK Delivery..
Own Marvel Retro - Great Responsibili-tea Mug from Deff, DVD, Blu-Ray & 4K Video Specialists - Free UK Delivery..
Own Marvel Retro - Great Responsibility Mug from Deff, DVD, Blu-Ray & 4K Video Specialists - Free UK Delivery..
Own Marvel Retro - Heroes Panels Mug from Deff, DVD, Blu-Ray & 4K Video Specialists - Free UK Delivery..
Own Marvel Retro - Iron Man Panels Mug from Deff, DVD, Blu-Ray & 4K Video Specialists - Free UK Delivery..
Own Marvel Retro - Not a Morning Person Mug from Deff, DVD, Blu-Ray & 4K Video Specialists - Free UK Delivery..
Own Marvel Phase 3 Part 1 DVD from Deff, DVD, Blu-Ray & 4K Video Specialists - Free UK Delivery..